It’s been a while since we’ve caught a prototype of the Porsche 718 Cayman GT4. Now that the track-only 718 Cayman GT4 Clubsport has been revealed, it seems like only a matter of time before the covers come off the road-going GT4. Our spy photographers have snapped some photos of the new GT4 being put through its paces at the Nurburgring, and it looks practically production-ready. All it’s missing is are Porsche badges at the front and rear. Compared to our last sighting of the GT4, the front bumper and diffusor are devoid of camouflage, giving us a clear look at the range-topping 718 Cayman, which will likely be produced in limited numbers. The only change we're expecting to see on the production model is the headlights being replaced with Porsche's LED units. In terms of styling, the GT4 looks more aggressive than the GTS thanks to larger intakes in the front fascia, a fixed rear wing, and a prominent diffuser. The dual exhausts are also wider apart than on the GTS. If the recently-revealed 718 Cayman GT4 Clubsport is anything to go by, the road car will be powered by a 3.8-liter naturally-aspirated flat six. In the Clubsport, the engine produces 419 hp and 313 lb-ft of torque, with rumors suggesting the road-going GT4 will have around 400 hp. Like the Clubsport, the Cayman GT4 will initially only be available with a six-speed manual, but an optional dual-clutch gearbox is expected to be offered later. The interior won’t be as barebones as the Clubsport, but thinner glass and fewer luxuries will help shed some weight. Recent spy shots also suggest a wingless Porsche Cayman Touring is on the horizon, which will likely launch after the standard GT4. 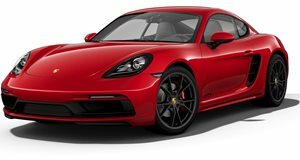 As for when the Porsche Cayman GT4 will break cover, rumors suggest it will debut at the 2019 Goodwood Festival of Speed in July, but it could be revealed online sooner.